As the Director of the Clinical Trials Office for Wilmot Cancer Institute, I oversee our state-of-the-art clinical trials while also educating my patients about their disease so they are as informed as possible. This enables my patients to participate in the process of making the best treatment decisions. Individual patients drew me into the field of hematology/oncology. I am driven by the desire to develop better, less toxic treatments for our lymphoma and leukemia patients. I also have an amazing team working with me that is focused on communicating with and educating our patients, helping them in every aspect of their lives. If I were to recommend one thing to patients, it would be to ask about clinical trials. While a clinical trial may not be appropriate in every circumstance, all patients should learn about these important options. Paul M. Barr, M.D. is an Associate Professor of Medicine and Director of the Clinical Trials Office for the Wilmot Cancer Institute. Dr. Barr received his medical degree from Northeast Ohio Medical University. His postgraduate training included an internship, residency and chief residency at Case Western Reserve University. He subsequently completed a hematology and oncology fellowship at Case Western and now holds subspecialty certification in Internal Medicine, Hematology and Oncology. 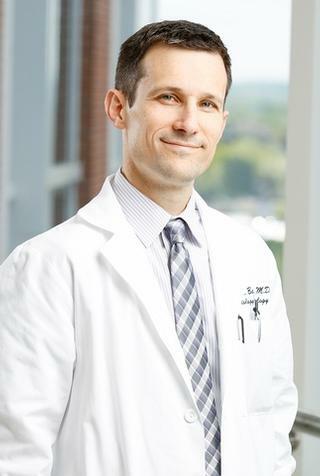 He is a member of the lymphoma committee in the Southwest Oncology Group and serves as principal investigator on several local and national clinical trial treatment protocols for chronic lymphocytic leukemia and non-Hodgkin lymphoma. His research interests focus on the development of novel therapeutics for patients with chronic lymphocytic leukemia and lymphoma. He has received a NIH funded K12 award during his training for his work with the organic amine Methoxyamine to improve the effect of fludarabine for CLL patients. Most recently, he was awarded a Clinical Research award from the Lymphoma Research Foundation based o his work developing combination therapies targeting molecules within the B cell receptor pathway for CLL and lymphoma patients. O'Brien SM, Byrd JC, Hillmen P, Coutre S, Brown JR, Barr PM, Barrientos JC, Devereux S, Robak T, Reddy NM, Kipps TJ, Tedeschi A, Cymbalista F, Ghia P, Chang S, Ninomoto J, James DF, Burger JA. "Outcomes with ibrutinib by line of therapy and post-ibrutinib discontinuation in patients with CLL: phase 3 analysis." American journal of hematology.. 2019 Feb 14; Epub 2019 Feb 14. Burger JA, Cramer P, Barr PM, Dilhuydy MS, Mato A, Byrd JC, Chang S, Graef T, Lin T, Tedeschi A. "Ibrutinib provides favourable survival outcomes in patients with comorbidities versus established therapies." British journal of haematology.. 2019 Feb 10; Epub 2019 Feb 10. Wierda WG, Byrd JC, O'Brien S, Coutre S, Barr PM, Furman RR, Kipps TJ, Burger JA, Stevens DA, Sharman J, Ghia P, Flinn IW, Zhou C, Ninomoto J, James DF, Tam CS. "Tumour debulking and reduction in predicted risk of tumour lysis syndrome with single-agent ibrutinib in patients with chronic lymphocytic leukaemia." British journal of haematology.. 2019 Feb 10; Epub 2019 Feb 10. Book Title: Augmenting Indolent Lymphoma Treatment Options with the Combination of Lenalidomide and Rituximab. Book Title: COUNTERPOINT: Can Chemotherapy Be Eliminated in the Treatment of Follicular Lymphoma?